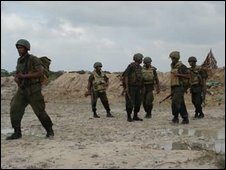 The Sri Lankan government has accused the Red Cross of inciting panic over the military operation against Tamil Tiger rebels in the north. A spokesman said the ICRC had ordered 35,000 body bags for the battle zone to create what he called a fear psychosis among the international community. The International Committee of the Red Cross confirmed a routine order of body bags but nowhere near that number. It said its office in Colombo had been attacked by protesters. Meanwhile the army says it is closing in on remaining Tamil Tiger positions, confining them to an area of about 200 sq km (124 sq miles). Government spokesman Keheliya Rambukwella said: "There is no need for 35,000 body bags or for that matter 3,500. "They may cancel the order tomorrow. But first they want to create a fear psychosis in the eyes of the international community." ICRC spokeswoman Sophie Romanens told AFP: "We help in the transfer of bodies of combatants across the front lines and for this we need body bags, but the number we have ordered is far, far less than 35,000." She said the main Red Cross office in Colombo had been attacked on Friday. "They were shouting slogans and pelting stones. No-one was hurt fortunately, but some windows were broken." 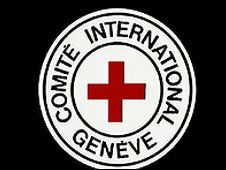 The Red Cross has said hundreds of civilians have been killed in the fighting in the north-east. Correspondents say the protesters were complaining that the Red Cross was favouring the Tamil Tigers. Aid agencies - most recently the UN's World Food Programme (WFP) - continue to remain concerned about the plight of thousands of civilians who it is feared are trapped between the two sides. The WFP said on Friday that 250,000 people are facing a food crisis. It says that it has not been able to get a supply convoy to the war affected areas since the middle of January. The Sri Lanka Broadcasting Corporation said more than 2,500 civilians had recently managed to flee the diminishing area the rebels still control and another 3,000 were "waiting to come over." A government spokesman said that UN chief Ban Ki-moon telephoned President Mahinda Rajapakse to discuss the plight of the non-combatants. It said he was given an "assurance" they would not be harassed. Meanwhile, troops are near Puthukudiyiruppu village, which officials describe as the last major rebel position. The BBC's Ethirajan Anbarasan says that if the army captures Puthukudiyiruppu, the rebels will be confined only to small villages, coastal areas and jungles, where close-quarter fighting will be intense. Senior Tiger leaders have not commented on the latest military claims. The UN says it now has no communication links with them. However the pro-rebel TamilNet website again accused the army of shelling a hospital. It released photos of dead people at Puthukudiyiruppu hospital, which it said came under fire on Wednesday and Thursday. Independent journalists are prevented by the government from travelling to war-hit areas, so there is no way of getting independent corroboration of either side's claims. On Thursday, the Sri Lankan army said that troops had captured a large quantity of automatic rifles, detonators and hand grenades from three rebel camps in the district of Mullaittivu. The army says that one of the camps belonged to the "Ratha unit" which provided security to rebel leader Velupillai Prabhakaran. The military also said on Thursday that it had captured the last major rebel naval base in the north-east. It said that the deputy leader of the rebel Sea Tigers unit was among the senior commanders killed in the fighting. Correspondents say that the fall of the Chalai base means that the Tigers now only have access to 20km (12 miles) of coastline in the north-east. The government earlier insisted there would be no ceasefire with the rebels, despite international calls for talks. Defence Secretary Gotabaya Rajapaksa rejected any amnesty for top rebel leaders, but said that "lower level cadres" would be "given amnesty, retrained, given vocational training and integrated into mainstream society". Meanwhile the government has opened an exhibition in Colombo showcasing materials, weapons and photos it says have been recently captured from the rebels.